I don’t know why I’m really writing about this, but after having played on the SPUF standard server (which you really ought to visit because it’s fun and all that) with ping that fluctuated between 270 and 400, I feel like I should. Normally, I’m okay with high ping. It depends mostly on where the server is, but I get more issues with American servers than, say Asian servers. Probably because there’s more sea between me and the physical location of said server. So, the first thing I ought to mention is that the game isn’t really laggy. I do get random lag spikes and such, but game play is normally fairly fluid. 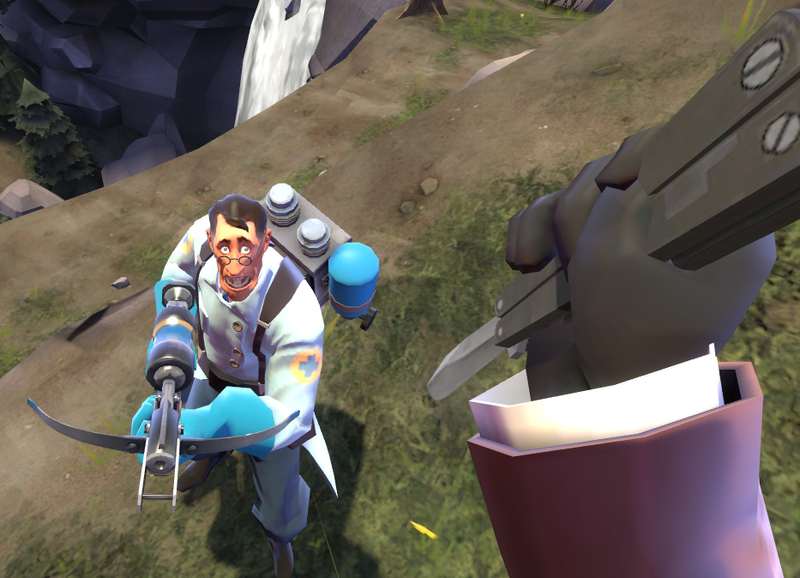 My frame rate is almost always steady unless a Sentry Buster just blew up next to me. The problem is with the details. At lower levels of bad ping, which most people seem to call 120-150 or higher, gameplay is fine. The only issue at this level are melee detection. Because melee depends on what the attacker sees rather than the victim, victims often find themselves dead, despite thinking they’ve made it. This is most prominent with Spies and Demoknights, but it can be an issue with Pyros too. As we progress to the 200 ping range, things start to get nastier. The issues with melee become worse and projectiles start to become affected. You may think you dodged that rocket, but it got you anyway. Actually hitting people becomes tricky as you’re slightly behind what the server is seeing. On the plus side, it’s harder to see where exactly you are, so Snipers can’t headshot you as easily. At levels over 300, melee is impossible. You can’t hit anything, but everything can melee you right in the face from across the map. The most extreme I’ve seen is being killed by a Powerjack Pyro on Turbine. He was standing by the big health kit in the main room, I was running towards my team’s intelligence room. I died. Also at high ping levels, fire becomes useless too. So do projectiles. Since it’s taking so long to update where everyone is compared to where you are, you fire your grenades and rockets but the current location of your target is out of date, meaning you do less damage. Since fire particles aren’t lag compensated, you probably won’t hit anything. Even if you’re right on top of them. There IS a positive side to all this. Hitscan becomes more of an option. Everyone knows of the dreaded 600 ping Sniper, right? Since hitscan also relies on the attacker and what he sees, regardless of the world around him, prediction and, heh, luck can be used to almost shoot through walls. Of course, at these dumb levels of ping, any other class is pretty much useless. Sniper Taunts vs. Spy Taunts? ← The Guillotine Games are over!